Changes to Unreal Tournament's CTF mode have so far proved "quite controversial," according to Senior Gameplay Programmer Joe Wilcox, who says in the latest Unreal Tournament Project Update video that the implementation of halftime, overtime and sudden death are just "the very beginning" of an effort intended to make the game "more friendly to a viewing audience." 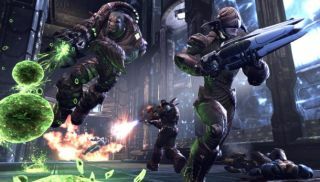 Community feedback will go a long way toward determining what, and to what extent, various aspects of the new Unreal Tournament are changed, but the developers are clearly making the game the game with e-sports in mind. "There are a lot of things we want to try," Wilcox says. "We really want to do some things presentation-wise that I think are going to be really kind of unique, that nobody's seen before and that are really missing in the e-sports arena right now in terms of giving the spectator a chance to gain more information without having that frantic pace that you always see in e-sports." Other topics of conversation including the translocator, the dodge button and the overall game speed, which is still being tweaked to ensure the game remains accessible to everyone. "The general consensus in the forums has been that the old UT99 players feel like we're too slow, and so we recently sped it up just a little bit," Senior Designer Jim Brown says. "But we don't want to get to the point where it becomes so frantic that the average player kind of gets lost in the shuffle or can't keep up." To find out more about what's in store in the new Unreal Tournament, have a look at our epic Epic interview from May.